Wyetech Labs from the snowy north of Canada currently makes four tube preamps. Except for the entry-level model which uses 2 x 5814As and 1 x 5687, it's 6SN7s exclusively for the others - three each in the two middle models, four in the top unit (which also adds one 6x5). 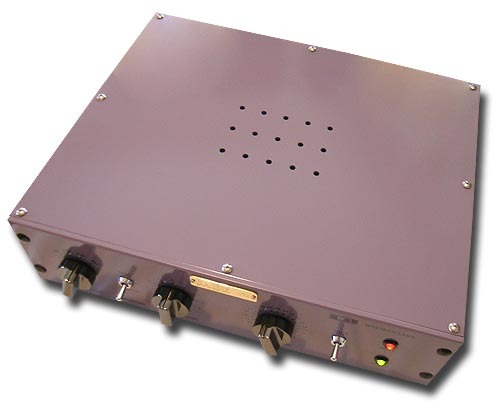 All models use a 3-stage grounded grid circuit for ultra-wide bandwidth to 500kHz and beyond. As you climb the model ladder, you get costlier parts and incremental refinements. What remains unchanged is yeoman construction inside and out. Life expectancy will probably eclipse your own. Having already reviewed the Coral (first preamp model from the bottom) and Pearl (third), I can further attest that with today's Jade (second), all share exceptionally low noise floors. What's more, pricing is kept sane by only selling factory-direct. This further connects prospective buyers directly with designer Roger Hebert. You'll enjoy the personal touch and support that such one-on-one interactions nearly always entail between passionate creators and their equally passionate clients. No-nonsense. Looking at how the plain yet sturdy box above is bolted together, that's what comes to mind. Turret-style point-to-point wiring atop fixed terminal boards is done for consistency, reliability and serviceability in the remote and distant future when a part might need replacing. 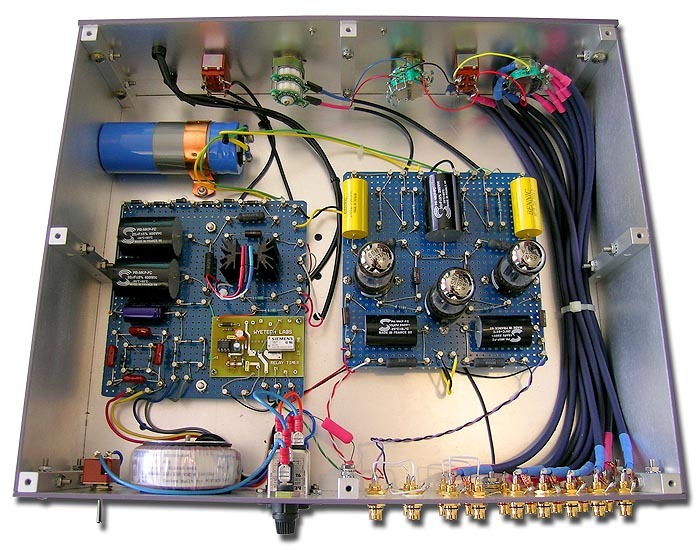 An externally accessible 115/230 voltage switch and power transformer happy on 50 or 60Hz further underscore practicality and far-sighted vision. If you build for the long haul, insure customers won't have to return their unit to the factory to get rewired for mains voltages other than how they began. Reliability commitments telegraph everywhere. Rotary controls are ultra sturdy, all buff Harley Davidson-type stuff rather than dainty wallflower affairs. The metal panels are unusually thick. The power, tape monitor and mute toggles clunk into action like miniature gears. Overbuilt is another way of putting it. Though that's in rather different form than, say Boulder or Rowland amplifiers with their bespoke extremism. The Jade is robust and fine looking like its siblings but certainly not a gussied-up doll or sparkly audio jewelry. Perhaps that particular quality/value equation which Wyetech pursues doggedly explains why this gear rarely if ever appears on the used market. People who buy it aren't swayed by fashion statements. Nor do they fall for boisterous advertising of the latest and greatest. Wyetech is a very quiet company. Its models remain unchanged. Ditto for their designer when it comes to marketing and political gamesmanship. He couldn't glad-handle a grease ball if you spelt it out for him. And he's one small outfit to boot. That means he wears all hats whether they fit or not. It also means that he doesn't operate with scale to afford inventorying large enough numbers of designer chassis parts -- elaborately machined face plates, extrusions and such -- to keep the pricing in his ballpark. Yeoman it is then. A certain stubbornness sneaks into this equation as well. Roger Hebert has finally retired his solitary two US retailers to go exclusively direct. World-wide! His dealer margins were leaner than lean. In turn, his dealers probably weren't as driven to push his wares as they were those with double the profits. Any reasonable maker would simply have adjusted his pricing. Give the dealers who truly did love the product the money they asked for. Let them deal with the marketing stuff which one personally detests and is poor at. Not Hebert however. Adamant about what he considers to be a premium value, he'd rather eliminate any and all representation in the market -- representation that could demonstrate his products -- than concede giving Caesar what is Caesar's. No price hikes then. No demonstration facilities neither. You want Wyetech stuff, ring or e-mail Canada and place your bet ... um, order. What with Germanic/Scottish ancestry, I've got my own and very excellent stubborn genes. In well-honed shape too. Jawohl. Hence I sympathize with Hebert doing things his way to control pricing. Alas, I also sympathize with 'philes on a budget who are prime prospects to go Wyetech. They'll have either never heard the name or hesitate because they can't go anywhere to see and hear it. That's why today's writeup. I bought Jade serial # 072 for personal use at full retail. I don't owe even one cipher of review copy for it. Still, most of us reviewing are into it for the passion of sharing first. And the Jade -- as is anything I've tried thus far from this small firm -- is a wonderful performer that deserves to be better known. I've had very good results partnering superior non-feedback SETs like my Yamamoto A-08S with passive preamps (whether text-book passive as in no AC connection or virtually passive as in no sonic signature). This type of combo avoids noise issues and maintains speed and transparency. However, many experts -- including Edward Barker on staff -- maintain that a superior tube pre like a Kondo 77 is vital to get a system to really sing. Kondo, top-level Shindo and Audio Note UK stuff - them's leagues I know nothing about. Where I care to play with preamps is a bit more earthbound. How would my system's current performance change if I replaced my customary TVC by Music First Audio or the stand-in PRe3 by Bel Canto Design with the Jade? What would I lose? What would I gain? In my experience thus far, preamps are a bit like powerline conditioners. More than amplify, they first and foremost condition the low-level source signal from digital sources. After all, those don't require additional gain to drive most amps to full output. In fact, we mostly listen below unity gain on our preamps' volume controls. Though we pay for active gain, we rarely ever use it. Why not stick with a passive attenuator-fitted source or amp then? Why not eliminate the pre altogether? Why not stick all components straight into the wall rather than insert a PLC? Depending on your personal explorations and situations, you have your own definitive answers already. Like with most PLCs, gains and losses with active vs. passive or no preamps tend to go hand in hand. Transparency, subjective speed and transient articulation could dilute on the loss side of the ledger. Weight, tone color, image density, textures and dimensional layering could increase on the gain side. Ideally, you'd want no losses and only gains. Needless to say, that's contingent on application. General rules don't really exist. Nor is there any accounting for personal taste. How can an active preamp condition a signal such that despite attenuating the output voltage below the input voltage, the end result is more - more drive, more heft, more body, greater dynamic peaks? It'll be best to consult the engineers for the skinny. Common sense suggest that it'll have to involve more suitable impedance matching and higher current deliveries from more robust power supplies. 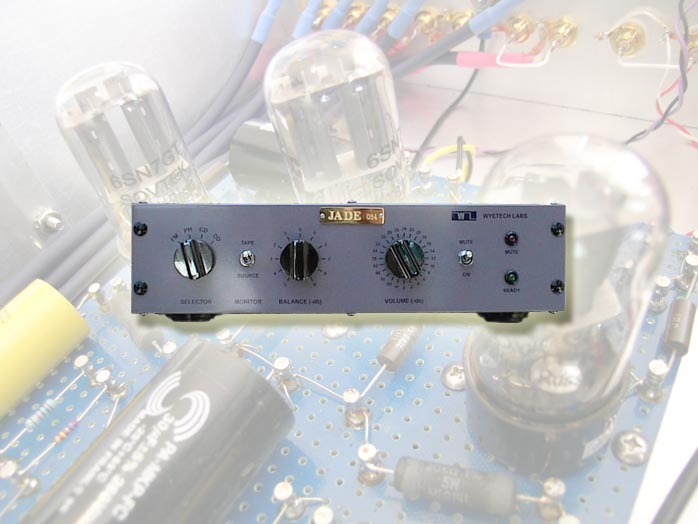 As you consider the role of a preamp in a modern context of digital components, it's quite mysterious that the best of the breed -- whether tube or transistor is besides the point -- should manage to improve the sound. That means improve the signal. By attenuating it. That's counter-intuitive. That's why my mind wraps best around this mystery by thinking in terms of conditioning. And that's also why it's remained an open-ended question. Conditioning the AC power is a double-edged sword. Likewise, to go active pre or TVC has been an ongoing contention. Whatever today's conclusion about the Jade, it shall, I'm convinced, remain a relative and personal conclusion. It'll be revised or temporarily suspended when a different amp/speaker context (or a changed mood or preference) calls again for a superior passive like my Music First or passive-acting Bel Canto. But today belongs to the Jade. It turns out that on my Yamamoto A-0S, having it in the rig is clearly better than not having it. With the Red Wine Audio Signature 30 -- whose inbuilt DacT attenuator allows its use without a preamp, period -- better or worse is far more ambiguous. The battery-powered Tripath amp provides more power and -- arguably more relevant even -- more current than the 2-watt direct-heated triode champ. On my Zu Definition Pro speakers, this and its already warmish voicing conspire to sound more immediate and hot-blooded without the Jade. The Jade does add a wee bit more body -- mostly noticeable in the two bottom octaves -- but also inserts a very thin sheet of transparent screening. Musical energy steps back a notch as though you had to relinquish a really good audience seat for one not quite as perfectly positioned. It's not a clear-cut outcome then. For maximum jump, speed and transparency on the Sig 30, no preamp is the ticket. For a bit more density and low-bass moxy, the Jade wants to be in the picture. Either presentation is persuasive and will have its admirers. I personally can go both ways. Currently, I tend to prefer the 30 solo. The tubed Yamamoto is a leaner and more lit-up amp than the transistorized Red Wine. Consequently, the super robust power supply of the Jade and its wide bandwidth add drive, weight and mass yet maintain speed and incision. Here I don't really notice a reduction in immediacy though that's ultimately hard to determine, precisely. The juicier and more massive presentation does its own to conjure up a bigger presence, even if the emphasis should be on 'bigger' rather than 'presence', really. aspects of the same thing. Reviewers with a philosophical streak can get fancy and finesse out endless new qualities to describe minuscule flavors and mystical terms. The average listener meanwhile feels lost relating to such apparent complexity and layer'dness of describing a singular experience. With this in mind, it seems most appropriate to call the Jade/A-08S combination bigger and ballsier, the TVC/A-08S version lighter and more oriented towards transparency. What's more involving? Unless you're in a more abstracted mode concerned with viewing and assessing, surely the former. It gets you into the thick of things and wetter. Of course the active preamp also has more gain and thus, more headroom. Can you hear headroom even if you're apparently never entering it? I don't clip the Yamamoto with the passive. Still, there's no denying that, like an adolescent male at the appropriate time, its voice drops and its frame fills out when the Jade intercedes between source and it. On a well-recorded happy-feet number like "Ya Habiby" penned by Flamenco dark child and actual rocker Raimundo Amador and performed rather jubilantly by flamenquito outfit Papa Levante, the rollicking accompaniment begins to do what people call - well, rock. The whole asks to be goosed so that you can enter this energy of displacement, of moving air, of big beats and tall waves all anchored in the bass. On the TVC, the sound per se isn't much different. Yet the sheer whomp and wallop, grab-you-by-the-short-hairs-and-squeeze pressure is distinctly smaller. Listening into the bass quality -- remember, most of the power bass on my speakers is reproduced by the front-firing array, not the sub-40Hz rear-firing subwoofer line source -- it felt as though (if I envisioned all the audible bass notes as reproduced by giant strings) these bass strings had gotten further tightened. There was more tension, hence more released energy. Translated into audiophile terms, we'd call that the audible effects of more drive. A related aspect is increased dynamic range though that too is hard to quantify in isolation if you carefully play things at the same level. Do the peaks then really get louder? Or do they merely seem louder because of something else? Frankly, I'm not in the mood to philosophize. The impression is what counts, ultimately, not what, persnickety-precisely, caused it. So let's be content to say that preceding the Yamamoto with the Jade seems to benefit dynamic range as well. 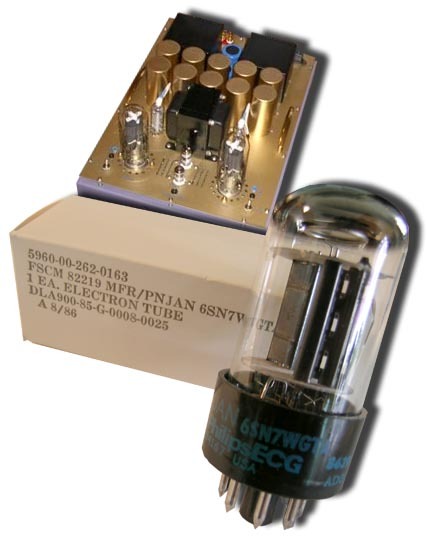 Compared to the 12AX7 family of small-signal valves, 6SN7s enjoy a rep as tone monsters [NOS version shown with spy photo insert of prototype Wyetech amp]. While it's true that I have heard preamps thus fitted exemplify -- or abuse -- that particular potential of the 6SN7, the Jade does not. Wyetech's Sapphire paralleled single-ended 300B monos already suggested to me that Roger Hebert favors a more transparent, faster and linear sound than is traditionally ascribed to that tube. The same holds true for the Jade if you approach it expecting what the 6SN7 is usually equated with - monster tone. There is a perceived enrichment or depth to tone color but it's far more modest in scope than the monstrous appellation conjures up. That's because the Wyetech, first and foremost, is a fast, ultra-quiet and transparent device. It doesn't so much fatten up the sound -- which would render it a bit ponderous or rotund -- as give it more verve (a term incidentally taken by a competitor's preamp that also uses 6SN7s). copy. But by filling out things dynamically and drive-wise, the grating part of the thinness is transcended so you can groove on Phil Bailey's awesome falsetto and the Tower of Power horns and dig the overall funkiness rather than stay upset by the lack of recording quality. Considering how thin the aforementioned sheet really is when and which the Jade inserts ahead of the warmer Red Wine Audio amp, the Wyetech gets a premium score for transparency. If you lose anything vis-a-vis the benchmark set by my TVC, it's fairly traded for the already described advances. Since everything in audio is a give'n'take and nothing comes entirely free, Roger Hebert has aligned his loss/gain score card very craftily indeed. Perhaps by the time you spend top Kondo or Shindo coin, you get TVC-like ultimate transparency and all the other goodies. I can only guess. Still, accounting for human perception, a leaner, more thin-blooded sound will often appear to be more transparent. That seemingly renders a more fleshed-out sound at an immediate disadvantage in that department. Where the Jade is concerned, that debate seems nearly academic. It does exceptionally well in the TVC bypass test and then goes places where active -- tube? -- circuitry perhaps becomes mandatory. For my Yamamoto amplifier, the Jade makes a perfect companion. And one which I could afford. I can always go back to the Music First or Bel Canto preamps any time the mood calls for a less earthy, more light-filled, slightly more cerebral sound. Compared to the ModWright SWL 9.0SE, the Wyetech is quieter over highly efficient speakers. Perhaps as a function of using that octal 6SN7 in an all-tube circuit rather than a 5687 in a hybrid variant, musical peaks scale with a bit more abandon over the Jade. The ModWright by comparison seems a touch reined in and a mite drier which isn't how you'd characterize it on its own. A reviewer who recently wrote up the 9 felt that it sits smack at the bend on the price/performance curve beyond which diminishing returns kick in rather sharply. I'd concur. 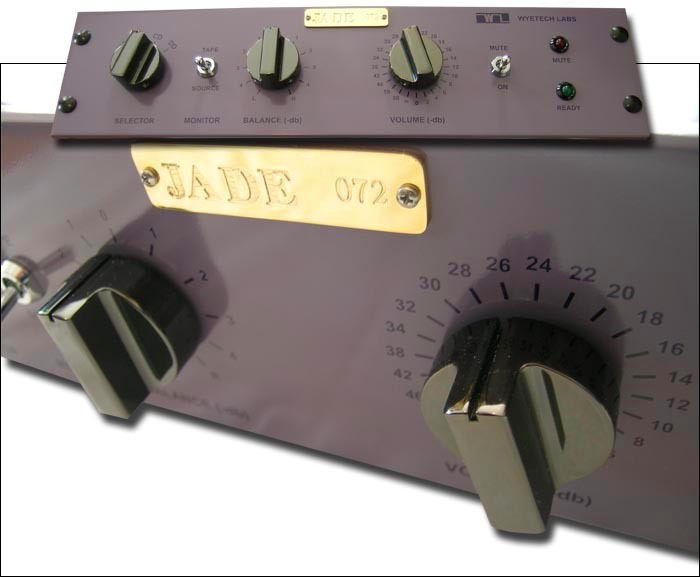 In fact, the same will very likely hold true within the Wyetech line when you view the two preamp models above the Jade. More money does buy you more, just less and less so. Considering published review opinion on Wyetech's top preamp efforts by writers with exposure to the really expensive stuff -- and considering how closely the Jade matches them in circuit and parts which this chart explains -- I'm thinking that most mortals won't see the need to look beyond the Jade. We'll leave it to our own Edward Barker to report on ownership of the Kondo M-77 and set our collective hearts aflutter and imagining.